Lots of crafting and no posting. So many good things have happened in the last few years. I've been to so many crops and making cards. Here's a little something of what I've been up to. Here's a Father's Day card I created using a random stamp and the Father's Day Cricut cartridge for the remote control. Slay using the Forever Young Cricut Cartridge. 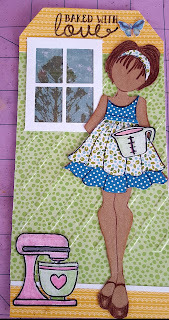 Oh how I love using Prima Doll stamps by Julie Nutting and Diamond Press stamps from Crafters Companion. Happy New Year to all my family and friends. I haven't post anything in 2013. I guess I've been just plain lazy. I didn't make any resolutions for 2014. I just want to be a better person. 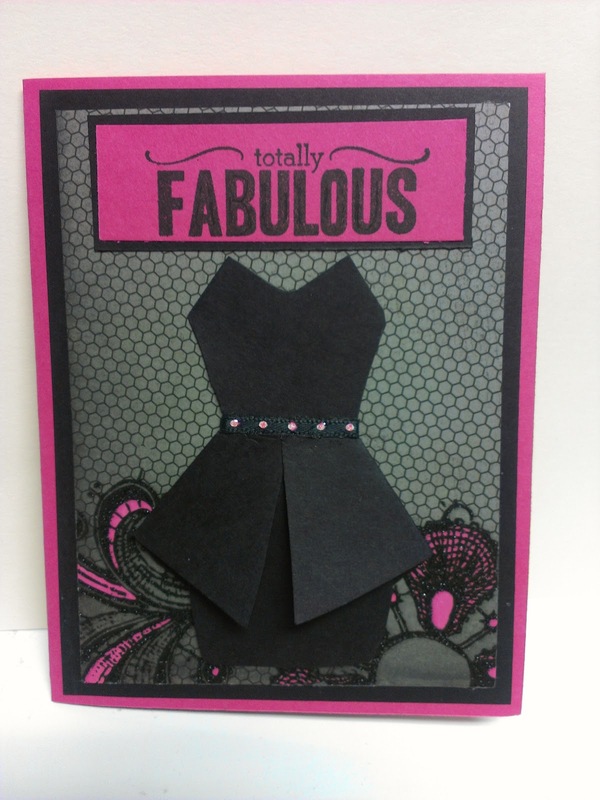 I'd like to really get back into crafting and posting more of my cards and other creations. So once again folks, have a Happy New Year and look for more crafty creations. Well friends, I have to admit, I've been a bit lazy. My first craft fair was great. My friends Renee and Cheryl were a big help. 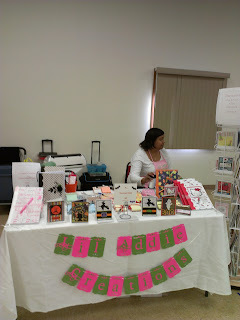 I didn't realize how much work you have to put into a craft fair to make it a success. Never the less, I really enjoyed doing it and will do more in the future. I didn't get to photograph many pictures. So here is one with my friend Renee. Big shout outs to Renee for creating this banner and Cheryl for stepping in with her creative flair. This is one of the cards that I will have on display at my upcoming Craft Fair, scheduled for Saturday, October 20th. I am so excited about this event. As I stated earlier, this will be my first time showcasing my creations. I hope this will be a success. 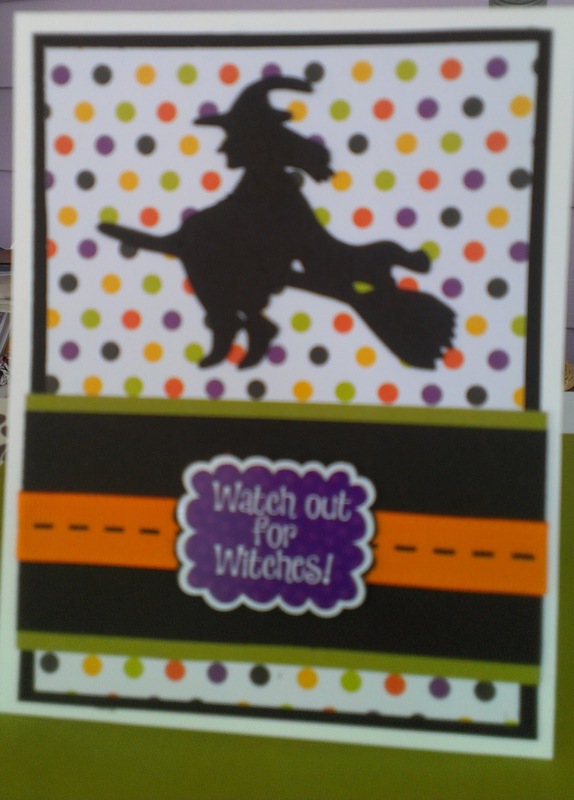 This card was created using Cricut cartridge Chic and Scary for the witch on a broom and the rest of the supplies are from Studio G. I purchased all the Studio G products at Walmart for .97. What a bargain. I purchased purple and black but too. I'll probably use them on another project. I am so excited! 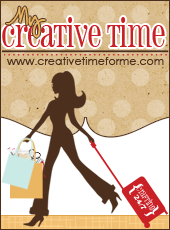 This October I will showcase my creations at a local craft fair. I made an altered Hello Kitty composition book with a matching ink pen. 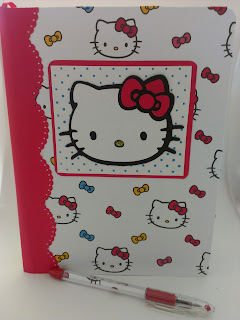 I want to have an abundance of cards, notebooks and other craft items to display. 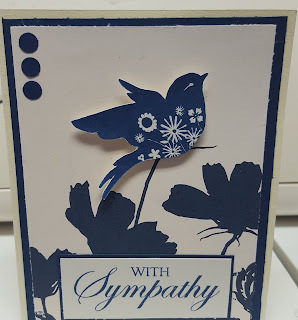 Of course I used the Hello Kitty Cricut cartridge and I stamped the blue polka dots using a Hero Arts rubber stamp and an EK Success punch for the red scallop side border. 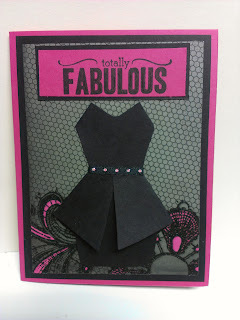 While surfing the web, I came across someone who is very talented and offered different paper crafting patterns. The blog is kellbellestudio.blogspot.com. Her patterns are amazing. I used Stickles on her belt and of course DCWV Street Lace pattern paper and recollections papers too. I went into my stash and created this card. 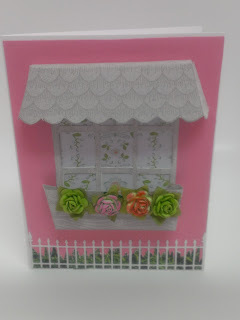 For this card I used a die from Memory Box, entitled Wrought Iron Fence, and of course my favorite DCWV pattern paper for the grass. I had the rubber stamps for years. The stamps used for the awning/roof and window box are from CC Rubber Stamps. I purchased these stamps from a store in New Castle, DE. The store has now moved to Meridian, Idaho. The name of the store is White Swan Rubber Stamps. That store was so unique! You could find just about anything you want pertaining to stamping. It was really a treat visiting that store.